Petrobras has certainly aggressively re-entered the market for production floaters. The Brazilian operator has just ordered two large FPSOs for use offshore Brazil and has five more FPSOs at various stages of bidding. Managing such a portfolio of contracts could prove difficult. ExxonMobil has also accelerated procurement of production floaters for its Stabroek block off Guyana, with one FPSO being built and two nearing contract. Meanwhile, global crude inventory has continued to fall as a result of strong demand growth and supply curtailment. Oil prices have fallen off over the past month. While spot Brent remains in the mid-$60s, the futures price has fallen to the mid-$50s. All this is detailed in the February 2018 WER Floating Production Report. 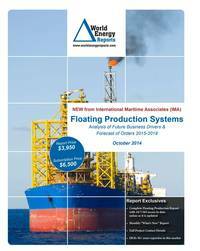 Also in the data section of the report are details for 227 floater projects in the planning stage, 50 production or storage floaters now on order, 298 floating production units currently in service and 29 production floaters available for redeployment contracts. Charts in the report update the location where floating production and storage systems are being planned, operating, being built and to be installed. Accompanying excel spreadsheets provide the report data in sortable format. Information is current as of 22 February.